Craig Caldwell's Father had a dartboard at home and Craig started to play as well as a kid. When he was around 17 he started to beat his father regularly and joined the local dart club. His first title was the NZ National Under 23 Singles Title in 1996. After that he took a 12 year break from darts and only returned to the WDF/BDO circuit in 2012. He is member of the New Zealand National Team and the winner of several Australian and New Zealand tournaments including the Auckland Open, the Canterbury Open and the Ted Clements Open in 2015. 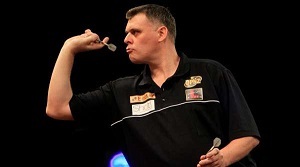 He qualified for the PDC Auckland Masters 2015 as well but lost to Phil Taylor in the Last 16. 2013 and 2014 he was part of the New Zealand Team in the PDC World Cup. 2016 he qualified for the BDO World Championship 2016 where lost against Scotsman Alan Soutar in the preliminary round. In 2016 Caldwell concentrated of BDO/WDF events reached a few semi-finals and won the North Island Masters. He again will represent New Zealand in the BDO World Championship 2017.